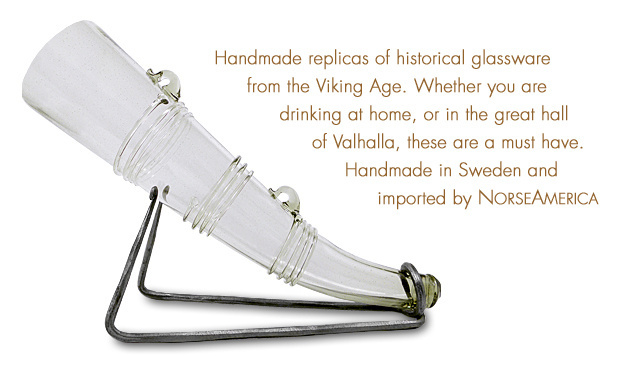 Handmade replicas of historical glassware artifacts from the Viking Age. The glassware in this collection includes replicas of pieces found throughout Scandinavia and specifically in countries such as Norway, Sweden, Denmark, England and Germany. They are the perfect gift for that hard to buy for Viking in your family. Scroll down to the bottom of the page to learn more. The first glass huts came to Sweden in the 1500’s, but it was not until the 1700’s that they began to produce glass on a significant scale. In 1990, our Swedish glass blowers developed their concept of historical glass and began creating historical replicas from the beginning of glass blowing up to the 1800’s. They focus on reproducing glass artifacts from Scandinavia, with an emphasis on quality and craftsmanship. Working in cooperation with museums and archeologists, they try to revive the ancient manufacturing methods in order to produce glass that is as authentic as possible. The glass is produced by hand using the same techniques used over 1,000 years ago. Each glass replica is unique because the size, thicknesses, color and numbers of small bubbles inside of each glass vary slightly. The earliest known blown glass can be traced to the 1st century AD and originated in the eastern Mediterranean area. The art of glass blowing then spread quickly across Europe, mainly due to the Roman Empire. The Romans developed glass blowing to a high level and created many unrivaled masterpieces. A major early glass blowing center was in the Rhine valley in present day Germany and France. From this area, there was an extensive trade in glass, and many archeological finds from the 6th Century throughout the Viking Age and into the early Middle Ages originated in this area. After the fall of the Roman Empire, there was a severe decline in glass making. Many glass huts were abandoned and the quality of both glass and craftsmanship were greatly inferior. During the Middle Ages a new golden age of glass began. Glassware was produced throughout Europe in wooded areas where they had access to fuel for glass furnaces and raw materials such as wood ash and sand which gave the glass tinted greenish hues. Glass made during this period is often called forest glass. The Medieval glasses are often ornamented with knobs, glass filaments and other decorations. The glassware shapes became simpler while engraving, grinding and painting on the glass began to increase. The cone beaker was the most common type of glass vessel during the Viking Age. Large numbers have been found in archeological excavations in Norway, Denmark, Sweden, northern Germany and elsewhere in Europe. The cone shaped vessel may explain some of the Viking drinking habits because a person had to drink “bottoms up” before putting the glass down. The Vikings drank honey wine called Mead, which was expensive. In addition to Mead, the Vikings drank beer made from bog myrtle, instead of hops.